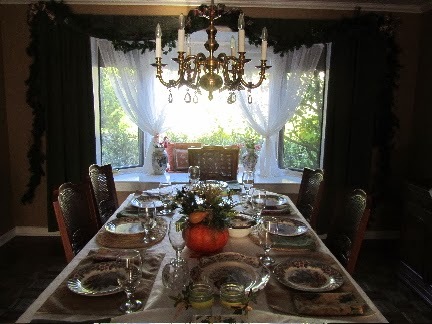 In yesterday's post, I had a photo of the table setting for our Thanksgiving dinner. There will be 10 of us for dinner, later this afternoon. 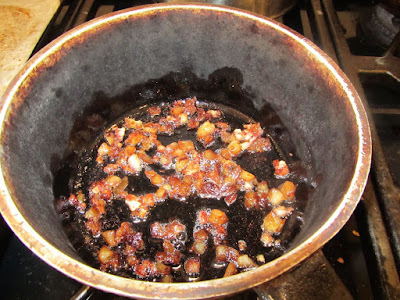 10 diners may not sound like a lot to you, but for us, with just 5 in the family, most nights I am cooking (and setting a table) for just 4 or 5, total. Our table seats 8. But on Thanksgiving, especially, we like to have everyone gathered around the one table. The Thanksgiving meal is a fellowship event, and we like to have the entire family tucking their feet under the same table on this occasion. No kids' tables here. To accommodate all 10 of us, we needed to make some adjustments. I'll let you in our our little "secrets" for today's table. I pulled our drop-leaf game and puzzle table up to the end of our fully-extended dining room table. The game table sits slightly higher than the dining room table, so the drop leaf rests on the dining room table top. I don't have a table cloth long enough for this improvised table, so I laid a card-table cloth over the game table, with the dining room table cloth layered over the top of the two tables. 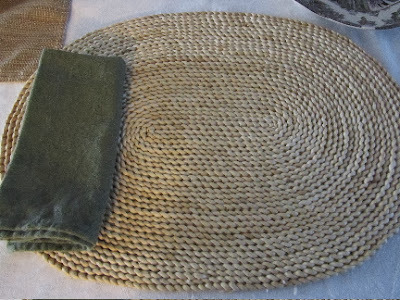 I like to use placemats on the table, even with a cloth. 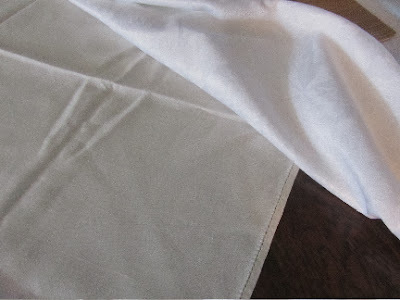 Most of my table cloths are at least 50 years old, with the oldest of them around 95 years old. These have been passed down to me from my great-grandmothers, on both sides of my family. 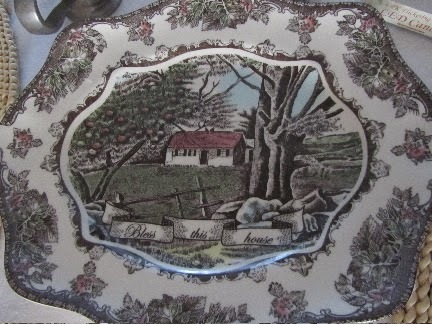 Adding placemats protects my family "heirlooms". However, I don't have 10 of any one design of placemat. So, you'll notice that I used two different designs of placemats and fabric napkins. 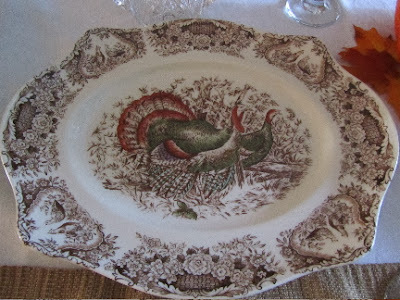 I think they all go together well enough, and go with the autumn tones of the dinnerware. The straw placemats are our patio placemats for summer. The sage green napkins are part of a set with a table cloth, that I made for our kitchen table. 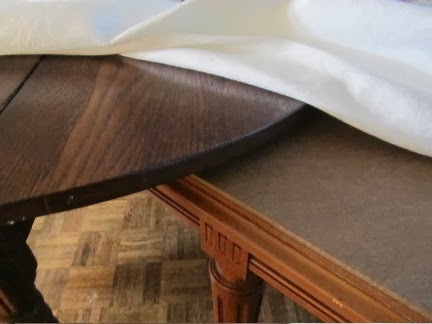 I folded the matching table cloth and used like a runner, over a side cabinet that is in the process of being refinished (the top has been sanded bare). 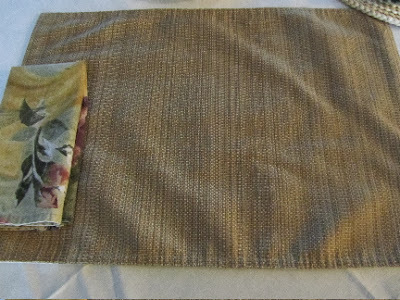 The striped fabric placemats and floral napkins are our "regular" dining room linens. You may also notice that not all the dinnerware is of the same pattern. picking up pieces that look like they would fit in with the rest, even though they're different patterns. The candle jars may look familiar. 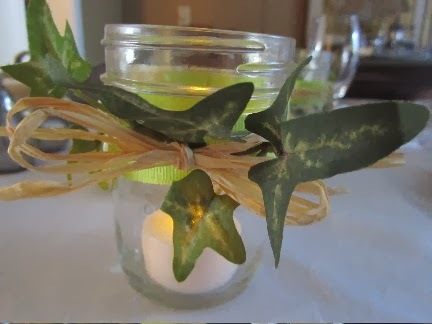 These are the same candle jars that I used on the deck all summer. I peeled out the used candle wax, and replaced with some battery "candles" for the evening. The colors of the ribbon, raffia and ivy coordinate with my overall color scheme today. 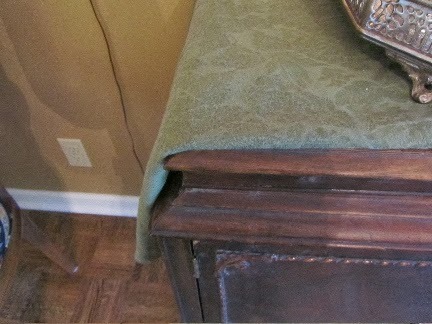 Our dining room has dark caramel walls, white trim, and dark sage green curtains and valance. These room colors influenced my table color scheme. The table is set in sage, camel, tan and white. This could look like a hodge podge of pieces. So many of the elements don't quite match. 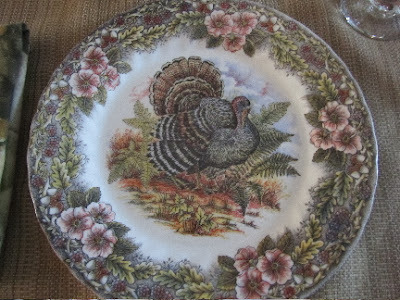 But I'm hoping that they're unified by the single color table cloth, the turkey dinner plates, and the color scheme. I think it all works. the table looks fabulous -- and the colour combinations keep it all looking well organized. Pretty sure even Martha Stewart would give it an A+. Happy Thanksgiving Day -- have a great time with scrumptious food and making fond memories. 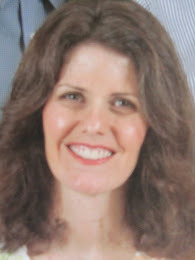 Thank you, frugal spinster! I hope you had a lovely Thanksgiving! Your table is very pretty, but not so formal that anyone should feel uncomfortable. Thank you, live and learn! I think everyone enjoyed themselves. Your table was gorgeous! Everything was similar enough not to be glaringly mismatched...if you hadn't posted this I would have thought it was intentional. Great job with the creativity! Thanks! Fortunately, I happen to like the slightly mis-matched look anyway. I think it's fun to see all the slightly different pieces. I hope you had a great Thanksgiving with your family! Lili, I always hated the children's table. It just felt wrong. You came up with a great way to keep everyone together in a beautiful way. Hope you had a festive Thanksgiving. I think you're right on the kids' table thing. Children can't learn what they're not exposed to. Anyway, I think the dinner conversation is much more interesting if every generation is represented at the table. I hope you had a lovely Thanksgiving!